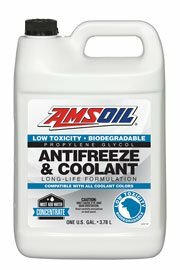 AMSOIL Propylene Glycol Low Toxicity Antifreeze & Coolant (ANT) is formulated to provide benefits beyond those provided by today’s conventional antifreeze and coolant products. Unlike conventional ethylene glycol-based products, which are acutely toxic, AMSOIL Propylene Glycol Antifreeze & Coolant is biodegradable and its low toxicity limits the threat to children and animals. Its unique formulation provides maximum cooling system protection in extreme temperatures and operating conditions. 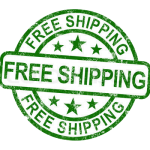 AMSOIL Propylene Glycol Low Toxicity Antifreeze & Coolant is dyed neutral yellow and is compatible with all ethylene and propylene antifreeze and coolant colors, as well as all plastics and elastomers (hoses, gaskets, etc.) found in cooling systems. It is also compatible with fully formulated diesel antifreezes and other organic acid technology (OAT) and hybrid organic acid technology (HOAT) formulations. Mixing propylene and ethylene glycol formulations can make it difficult to predict freeze protection. If mixing for top-off is unavoidable, it is recommended to flush the cooling system at the next convenient opportunity.